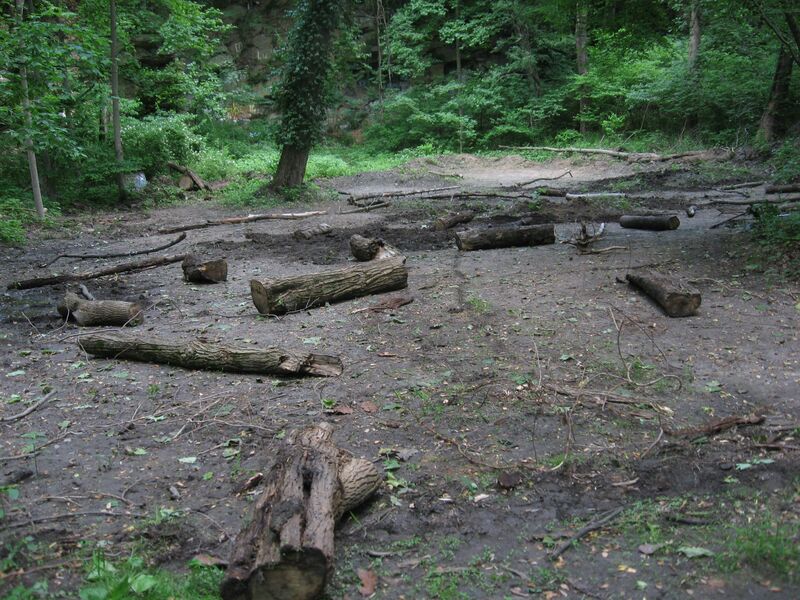 THE ISSUE OF APPROPRIATE USE OF PUBLIC LAND HAS COME HOME TO US, HERE IN MORRIS PARK: AN AREA OF THE PARK WAS ILLEGALLY CLEARED OF ALL VEGETATION AND TOP SOIL BY EARTH MOVING MACHINERY – IN ORDER TO CREATE A RACE TRACK FOR REMOTELY CONTROLLED MINIATURE AUTOMOBILES. 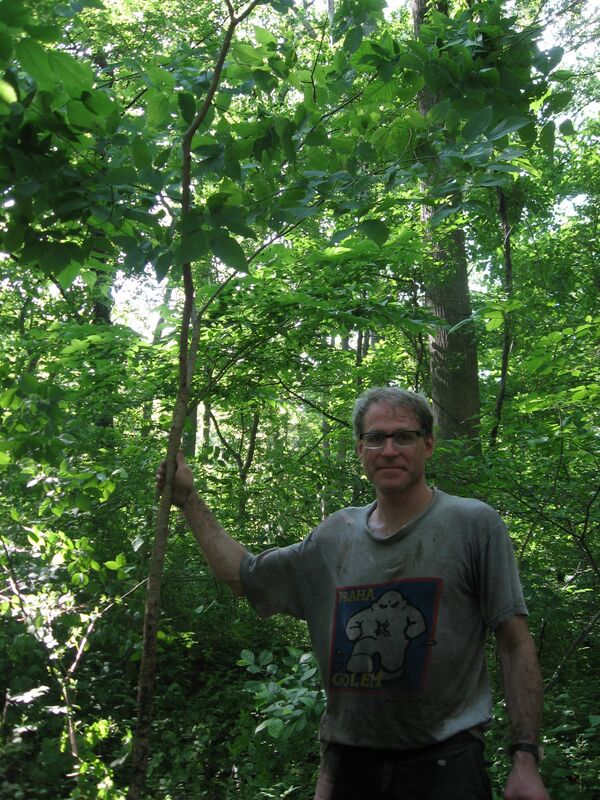 Look at the forest floor in the pictures above and below: we are so fortunate to still have woodland pockets, right here in the City of Philadelphia – however even those small areas of woodland are under harsh assault. A whole section of the park, by the old quarry, was leveled to facilitate the activities of a remote control miniature car race club. 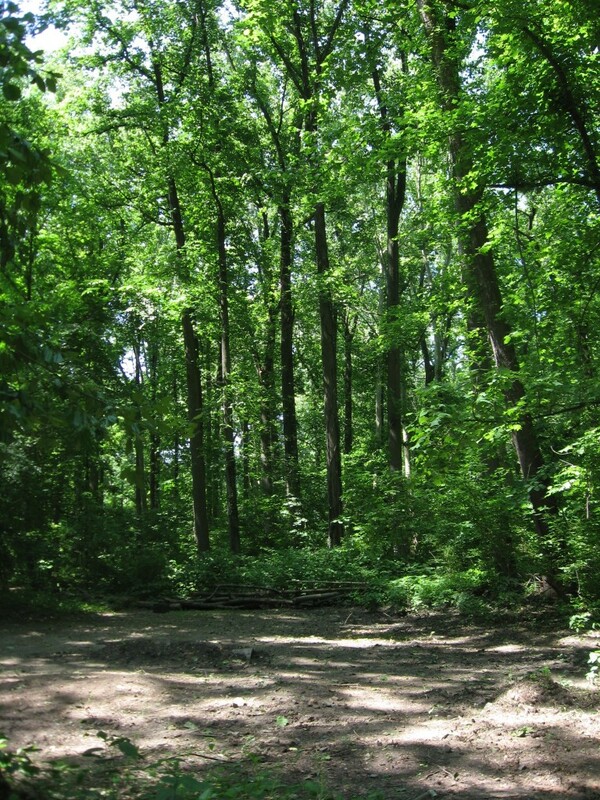 All vegetation in that area -trees, shrubs, and herbaceous layer, were annihilated without any prior proposal to the community, and with no permission from the City of Philadelphia. 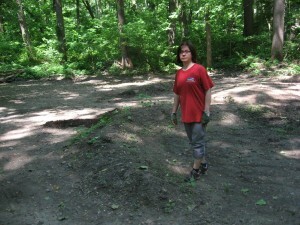 Isabelle is not happy with the removal of all native vegetation and the 6 to 12 inches of top soil that was removed from the site. After being given an order of cease and desist from City of Philadelphia officials, the activities of remote controlled motorized vehicles continued. We needed to take action immediately in order to physically shut down the operation. This involved removing the dirt mounds that were created to serve as jump ramps in the race track. The other concern we had, was to address the issue of top soil removal from the site. 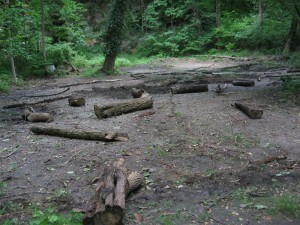 We found piles of branches that were cut off from the trees that were cut down to create the tracks. 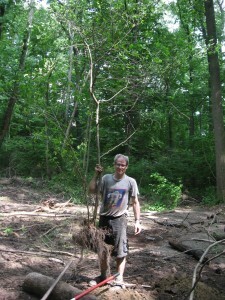 These tree branches were piled on top of the original top soil of the site, which is still ringing the site in the form of a mound of top soil, around 5 feet high. The group that initiated the race track, the Royal Gardens Association, reported that they only cut down dead trees in the area, after they were confronted with their illegal activities. However this Tulip Poplar we found in the rubble of destroyed trees contradicts this claim. 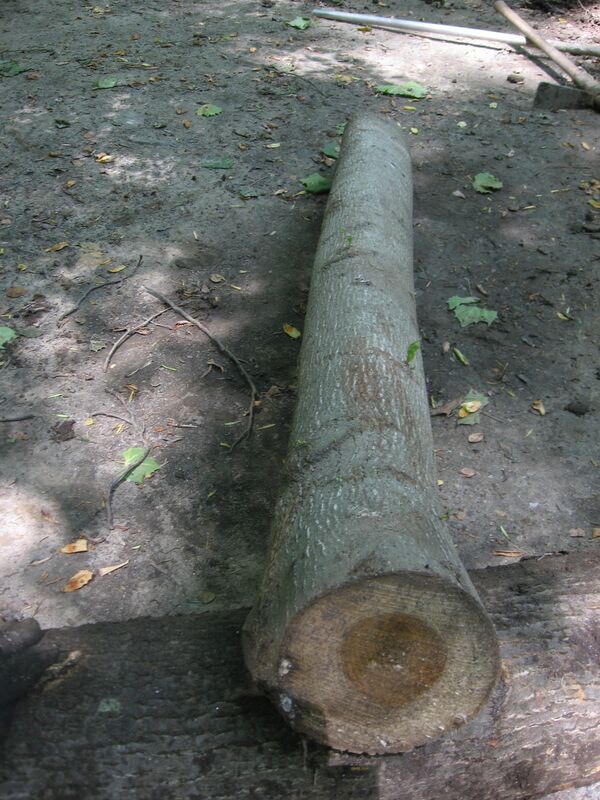 The picture above shows a live tree that was recently destroyed: the growth of leaves from this cut stump is indicative of a recently cut live tree. Also, even if a dead tree was taken down, it is not OK in a forest. From the perspective of environmental preservation, a dead tree has an important place in the forest ecosystem, and serves as a habitat for native forest insects and birds. If you live in an area where you feel that there is a misuse of the public land, you should not hesitate to bring awareness of this, and to question the use of the land. Is this for public good? Is this good for the environment? There should be a policy in place for public use of land. And this policy should include the importance of natural lands, such as riparian zones, forests, and meadows, for example. It should also include the usage of public land for recreational activity needed by the community – ball fields, vegetable gardens, dog parks, picnic areas, playgrounds, water parks, skate parks, etc. These issues need to be considered when authorizing land use: what is appropriate? There are some natural areas that are environmentally sensitive, from a drainage and water retention point of view, such as flood plains, swamps, bogs, vernal pools, etc. This specific area that was destroyed falls into this environmentally sensitive category. This is a floodplain area, which means that on a periodic basis, Indian creek will become a drainage conduit for a fully saturated watershed, usually during a significant rainfall period. In an urban context, drainage conduits are put under unusual stress due to the impervious surfaces of the city, from asphalt streets, to sidewalks, parking lots etc. The impervious surfaces direct the water to the creek the way water runs from a showerhead in a bathtub into the drain. In an undisturbed watershed, much of this water would be absorbed and retained by the soil, and further retained by the plants growing in that soil. This could be described as a natural retention basin. A swamp or bog is the best example of this because they are in a continuous state of water retention. Imagine if you lined your kitchen sink with sod and poured a gallon of water into the sink. How little water would make it down the drain? Thus Indian Creek which flows right next to the completely cleared site will become flooded in these rain events, often in a rapid, unnatural manner, with water rushing over its banks and onto every surface on the ground level of the floodplain. In an undisturbed setting, these natural events do not harm the surrounding forest, because the speed of the water, as well as the contact the water makes with the topsoil is regulated by a mixture of trees, shrubs, and forest floor plants that serve as a rooted buffer between the rushing water and the topsoil. Many of these plants have taken millions of years to evolve. They have become suited to periodic flooding, and they have served to prevent all of the soil from being eroded from the land into the ocean. This allows soil retention, so that many varieties of species can grow and be a part of the forest ecosystem. This means that there will be plants that serve as habitat for birds, such as Owls, Cardinals, Woodpeckers, Eagles and Robins, among hundreds of other vital species that need Morris Park to survive. Without these plants, the birds will have lost their habitat, and will have to look elsewhere for the food that they need to survive. In many cases elsewhere does not exist, because of increased urban development and the removal of forest. In many cases a section of forest, such as the one destroyed by the racetrack construction, is the sole habitat for migrating birds that have been depending on this site for generations. Imagine coming to your block after a long day at work, to find your rowhome destroyed. You cannot just move in next door or onto the next block. 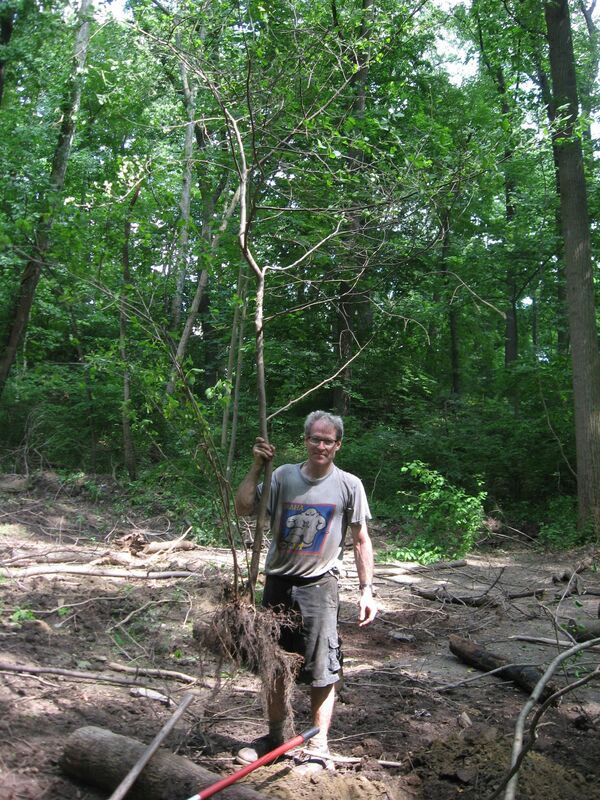 The Sanguine Root environmental restoration team found hundreds of live native plant specimens buried in the rubble of the bulldozed topsoil. 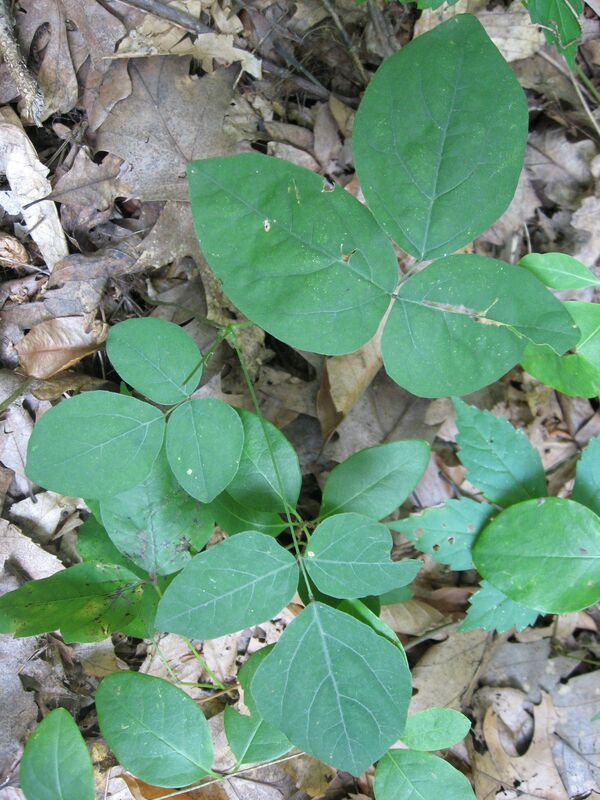 We found live sections of Virginia Creeper (Parthenocissus quinquefolia) an important groundcover and vine, Virginia Knotweed, an herbaceous woodland plant, as well as shrubs such as Hackberry and Spicebush. The piles of topsoil were close to five feet high, and each one was full of live native plants, many of them yellowed and whitened, on the edge of death. We worked for hours trying to spread out these piles, and in some cases actually replanted some of the shrubs including a 12 foot tall spicebush and an American Hackberry that was buried in the rubble. If we had the time and the resources, we estimate that most of the perennial herbaceous plants and some of the shrubs and trees could be rescued from the rubble and revived- in a sense, a restoration of the site. Mayapples, Solomon and False Solomon’s seals, Jack in the pulpit bulbs, even the roots of Wild geranium, and the bulbs of Spring beauties could be sifted out of the rubble in an archeological operation of massive proportion. It really could be physically accomplished, that this site could be replenished of the original herbaceous perennials, and even some of the shrubs and trees as well as the topsoil, with either moving equipment or a large volunteer effort. However, this is not realistic. The amount of topsoil removed was astounding to us. We tried to put it back. 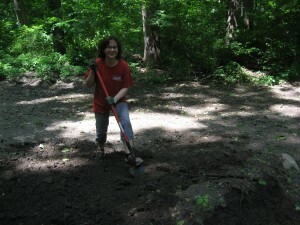 We had shovels and worked furiously for hours on end in the heat. We busted up the jumping ramps built in the middle of the site, and then began working on the edges where most of the soil was piled up. 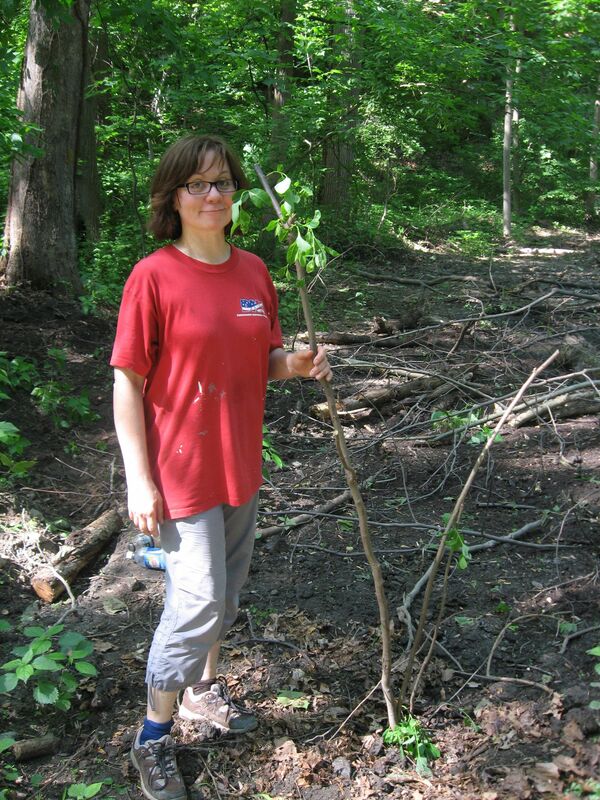 That was when we found all of the live native plants buried in the rubble. We worked from there, dispersing the soil, hoping that we could at least re-seed the area a bit with whatever native seed-bank was in that soil. Maybe next year a Jewel-weed will grow on the site, instead of being buried under 3 feet of soil, never to germinate and rot away. Jewelweed is an important part of the ecosystem, valued by the ruby throated hummingbird as a nectar source, just for starters. 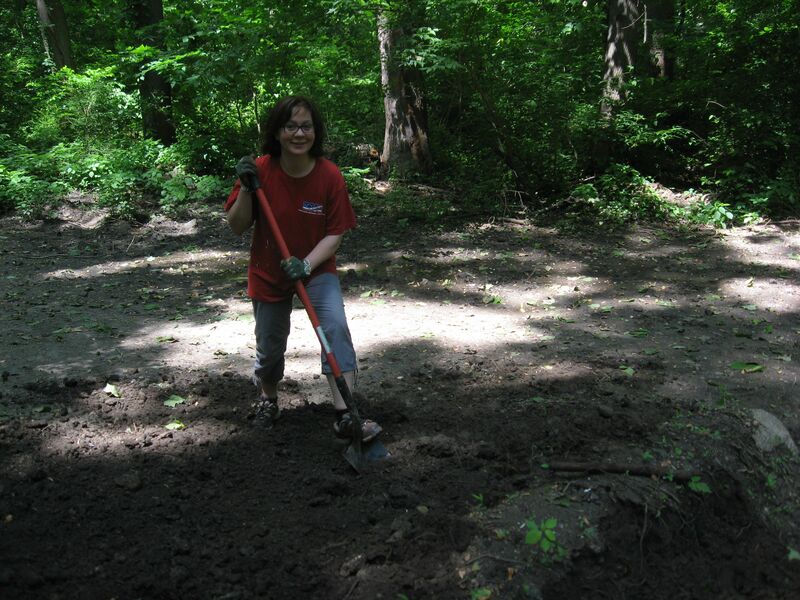 We dispersed as much of the topsoil as we could, keeping in mind that every shovelful contained hundreds of seeds of native plants that will help this site regain its balance in the ecosystem. Also keeping in mind that there is a family of birds, somewhere, that is on its way to this very site, flying for thousand of miles with every intention to land right here in this area, and they will find it desolated, devoid of all plants and even topsoil. We will do everything we can to stop this, and reverse the damage. We know we can do something about it. THE COMMUNITY IS SHOCKED AND DEVASTATED. THERE IS AN UPROAR OF ANGER AND DISCONTENT. PASSIONATE, ANGRY LETTERS ARE BEING WRITTEN, EMOTIONS ARE AT PEAK. THE NEIGHBORHOOD HAS FELT THE DISTURBANCE. It was Good Friday, the unofficial holiday Friday before Easter. The Sanguine Root received a report from a neighbor about the racetrack. We were completely chilling, having taken off work early, and were admiring our garden in the fine spring afternoon. The report came in from a dog-walking citizen who was very upset and needed to tell us something important. We immediately went into the park and witnessed the horror for ourselves. A whole swath of the forest had been cleared. Trees chopped down, the topsoil removed, and there were men operating loud machines, with high-pitched internal-combustion engines, the same engines used in cars, but miniature versions, so that they were blasting at our eardrums, and we could smell the fumes rising up from them. The men had dogs tied to the remaining trees and there was trash all over. The scene was apocalyptic. The police, Park officials and Park Rangers were called immediately. Activity ceased until Sunday, and they were back at it with the race cars. On Monday morning they were back as well racing the cars. The high-pitched squealing sound of the engines could be heard from inside the homes on our block. At this point, there was more to the issue than the environmental damage done to the forest, the ecosystem, the birds, the herbaceous plants, the soil, the watershed, or anything to do with nature period. Now, on Monday morning, the issue had creeped into the very fabric of our neighborhood. This is a block of families with small children as well as wage-earners, business-people and professionals many of whom work from home and are on business and conference-calls throughout the work day. This is what pays the mortgage and the bills. Not only that, there are houses for sale in our neighborhood, the last thing we want is for prospective buyers to know that there is an illegal car racing operation going on in the park next door. However, for all of you prospective buyers out there: We have destroyed this racetrack with our own hands. The City of Philadelphia has issued the order of ‘Cease and Desist.’ They have also given us community volunteers the go-ahead to remove the racetrack and have offered us the support of any help they can give us to restore this area back to the woodland riparian area that it was. This is a neighborhood of vigilant and active citizens who value the elegant Arts and Crafts rowhouses we own, and our carefully cultivated gardens as well as the camaraderie of neighbors from one block to the next. We value pluralism in our’s neighbor’s backgrounds as well our unified love for our community. Our community meetings often end with long conversations in the parking lot and lasting friendships. Summer evenings are spent strolling block after block meeting with new neighbors, re-connecting with neighbors or just going to visit our favorite neighbors. We always end up discussing the neighborhood and quality of life. Often times the issues of the Park are discussed, and generally, the love of the park for its natural beauty is the dominant tone of discussion. We are a strong community, and we will not tolerate the inappropriate use of our park for a racetrack. We believe in the rule of Law. We live in our homes because of these laws that are designed to help us live better lives, so that we can live safely in our homes, and be happier, free of stress. We live in a society that agrees on certain things; that it is unlawful to alter the homes of other people without the expressed permission. That it is unlawful to alter or disturb public lands without authorization from public authorities. The outright destruction of our public land is what deeply disturbed our law-abiding citizen neighbors, ourselves included. The anger and outrage of our neighbors resonates deeply. Our own anger over this matter has been an ongoing struggle, something which has effected our daily lives. For all readers at this time, all you need to do is scroll through our months of dialogue and discussion of the natural environment that we live in and in the bigger picture, truly depend on for our survival. We as humans are not independent operators in the world or are we the dominant species, as much as it may seem true. Some very upset and angry neighbors have expressed sentiments that ring true to our ears, and get us very worked up- such as that,” if we lose this battle, we will lose the park”. This brings up a very important issue, which is that of precedence. If the race car track is in any way approved, what else will be allowed? Motorcycle racetracks? If that is allowed, then how about All-Terrain Vehicle racetracks? If that is allowed, how about monster truck racetracks? There is no end to how Fairmount Park can be abused in the name of the visions of hobbyists who in no way represent the needs of the general public. Land use is a continuing, evolving issue in society. Urban park land use is at issue here. We at the Sanguine Root, and many members of our community are in agreement that the woodland areas of Morris Park are a natural treasure, and they should remain as a natural forest. This is a special place where we can walk from a block of rowhouses and take the trolley into Center City Philadelphia, or we can walk into a forest along a woodland path. The forest in the city is something we want to preserve. The past events have awakened us to the fact that not everyone understands the value of this asset. 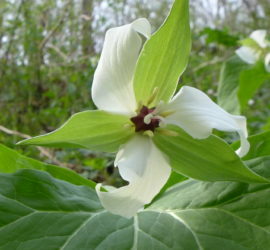 We spend much time discussing native plants that grow in the forest because we find them interesting and meaningful, and the joy we get from them we want all of our community to experience. To have this park at our doorsteps in the city has an important meaning and speaks volumes about the potential of urban living- that cities can co-exist with natural places. 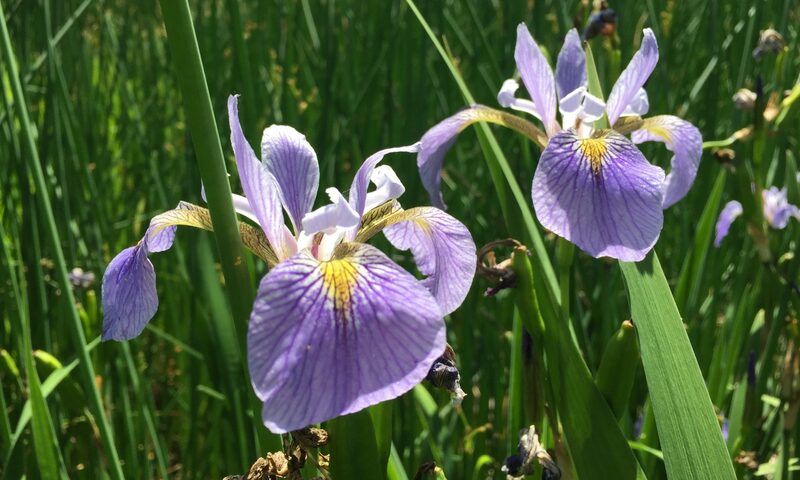 That maintaining these natural places can be an entertaining activity and a way to bring a community together for a unified purpose, whether it is cleaning up trash or removing exotic invasives. A neglected public park full of trash, where there are masses of invasive vegetation can be a liability. However the process of transformation is life-affirming to the neighborhood. We encourage anyone living near a blighted public space to begin to turn it around. Contact the local public/ park officials, and obtain permission and guidance as to where to start, and what to do. Assemble interested neighbors to help. Encourage all of your neighbors to assume a leadership role, so that there are no leaders or followers, that the park is truly a public space where we each have a unique but equal stake in it. The civil discussions of the Park’s usage will go from there, and now this formerly under-used, almost abandoned public space has become part of civil society. Just this one specimen is actually blooming. If there was one other in the vicinity blooming, then there could be viable seed in the fall. The tree is self-sterile, which means that there needs to be two separate trees blooming near each other that cross-pollinate in order or the seeds of each tree to be fertile, which means that they will germinate the next season and grow a new tree. However this is not the case. This blooming tree will not succeed in creating fertile seed in these conditions. We looked carefully among the many other Chestnut trees growing in the area for another one that was blooming and there were none. This may well be the only blooming Chestnut tree in all of Philadelphia. Just to see this tree blooming is a rare sight, and we savored the view. 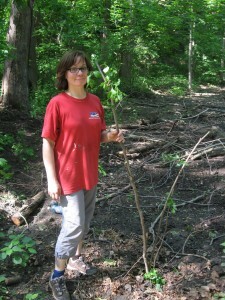 This is a tree that has become blighted and reduced from a canopy tree that covered the Eastern United States to a shrub that barely makes a presence on the forest floor. The blight was brought in as an introduced fungus on the Chinese Chestnut tree, imported to the Bronx Zoo in New York City in 1904. The Chestnut Tree was the tallest and most majestic tree in our forests. It gave us the Chestnut, a sweet and nutritious nut (from the many written accounts), something that is now gone completely just 100 years after the initial introduction of the Chinese chestnut, which was carrying the deadly fungus, but is not affected by it. 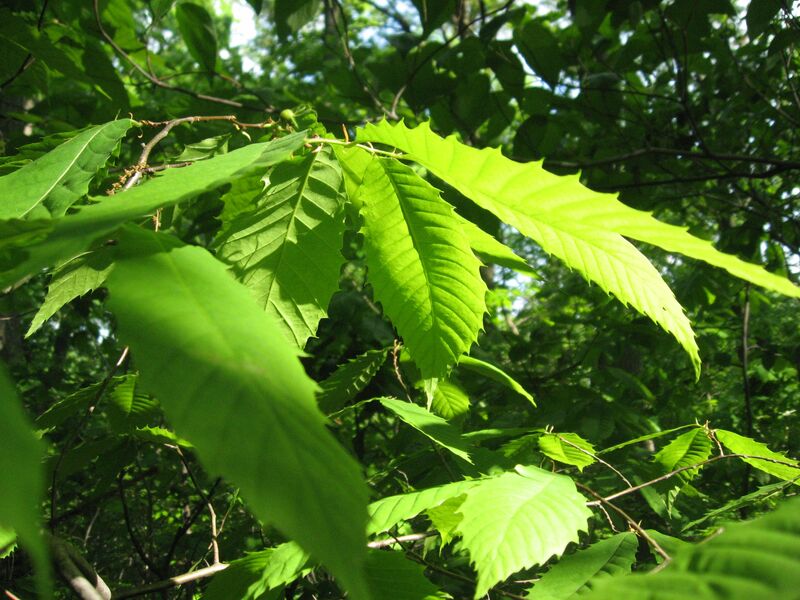 The fungus that was growing on the Chinese chestnut was completely overlooked, yet the effects it has made on the entire forest of the Eastern United States is completely devastating. It ended up destroying billions of trees, and has brought the American forest into a state of disrepair. The blight only kills the living tissue above the ground level. 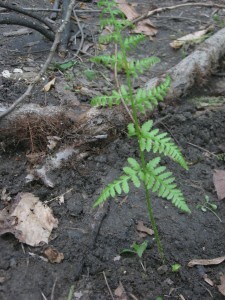 The roots are not affected and they continue to send out shoots, which become shrubs. And from time to time, these shrubs will bloom, as if they were the trees they once were. Then there is the question of why do we care about having a Chestnut tree, here in West Philadelphia, produce a viable, fertile seed? To us, the Chestnut trees that still manage to grow here are still hundreds of years old. The ones that are now mere shrubs were once majestic canopy trees, with massive trunks, 6 feet in diameter. To have these same trees create seeds and if these seeds grew into new trees, then these new trees would represent the original genetic pool of the trees that grew and still grow in this very area and region for thousands of years. Someday if a disease resistant strain could be created, then there would be the option of breeding a’ Philadelphia’ tree with the newly developed one, and the local provenance of the tree could potentially live on into the future. It is important to keep a species alive, it is also important for any given area to keep a local population of that species alive. 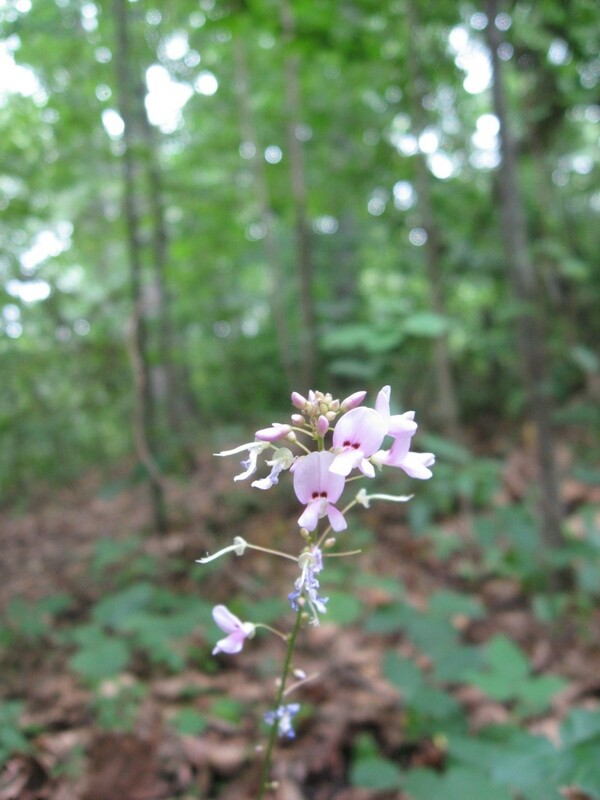 This local population has adapted the best to that area, whereas specimens from an introduced population may not be as hardy or adapted to the specific conditions of the locality, and they may wither away in the long term. Or they may become invasive. 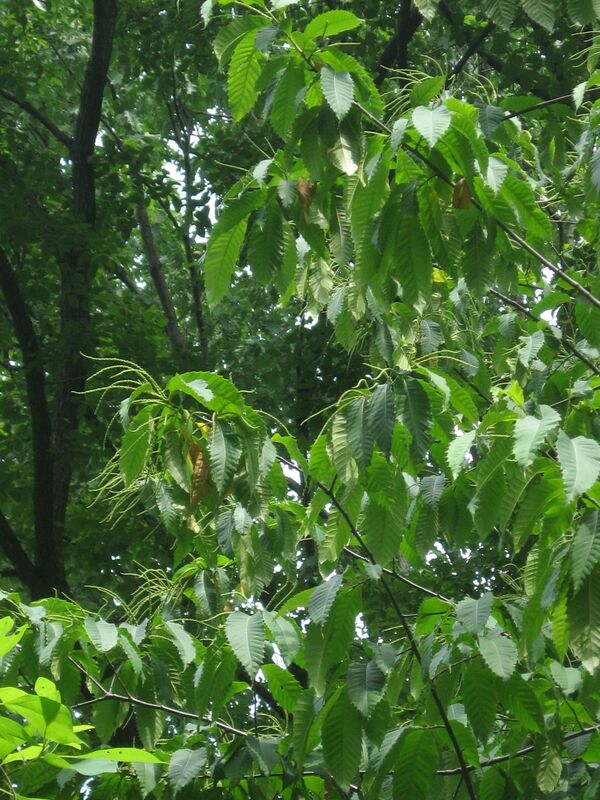 When we saw the blooming catkins of Castanea dentata, the American chestnut tree here in Morris Park, we felt a bit of what it was like just 300 years ago, right here in this area of what we now call Morris Park, Philadelphia. This blooming tree, for the most part reduced to a shrub status as a species is doing what it has been doing for the many thousands of years before our time.